Royale Lepage and the Revelstoke Women's Shelter are teaming up to organize a MASSIVE SIDEWALK SALE May 11th. 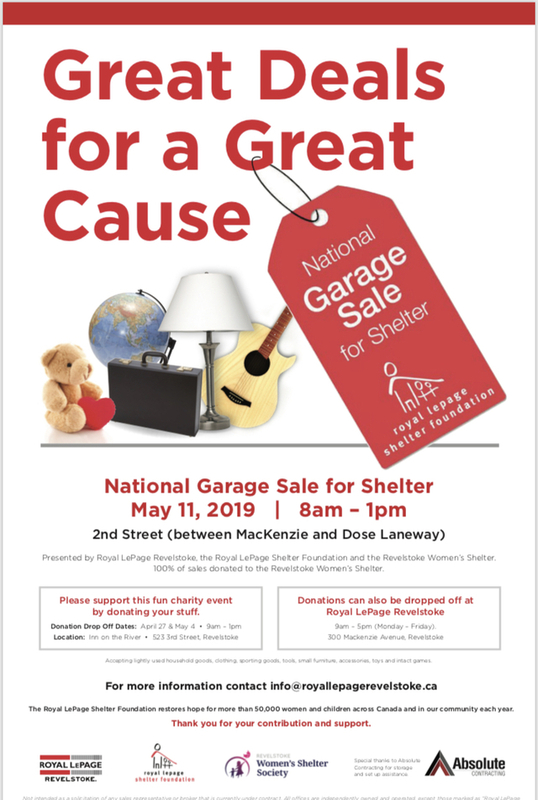 If you are moving and need to offload any furniture, household goods, tools, clothes, baby toys, etc., please consider donating them to this great cause. Two main drop off dates have been organized at Inn on the River: April 27th and May 4th from 9am-1pm. If you are unable to make these dates, alternative arrangements can also be arranged by contacting Royal Lepage: info@royallepagerevelstoke.ca. Join us on May 11th and come get some quality goods for cheap! All proceeds to to the Revelstoke Women's Shelter Society.